» 12 Ft or 15 Ft Trampoline: Is a 12ft Trampoline Big Enough? 12 Ft or 15 Ft Trampoline: Is a 12ft Trampoline Big Enough? Trampolines are fun for the whole family. Whether you are buying your trampoline for play, or you’re buying a trampoline for the budding gymnast, trampolines are great entertainment. Trampolines are great for keeping the kids close to home, and they are nice to have when company comes as well. However, when it comes time to buy a trampoline, the question of what trampoline size to buy may pose a problem. Is a 12ft trampoline big enough? 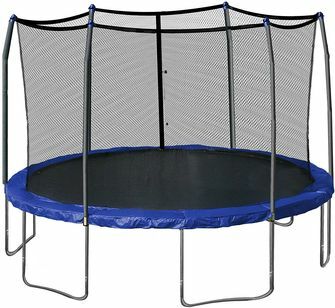 Do I buy a 12 Ft or 15 Ft trampoline? Here a few facts that may be helpful. First, the more square footage of surface area you have on a trampoline, the more bounce you get. So, in comparison, a 15-foot trampoline will have more bounce than a 12-foot trampoline. In addition, when deciding between a 12 ft or 15 ft, you may want to consider what types of activities your children will be using it for. For instance, 12 ft trampolines are big enough for play and normal bouncing around, while 15 ft trampolines are made more for gymnasts. 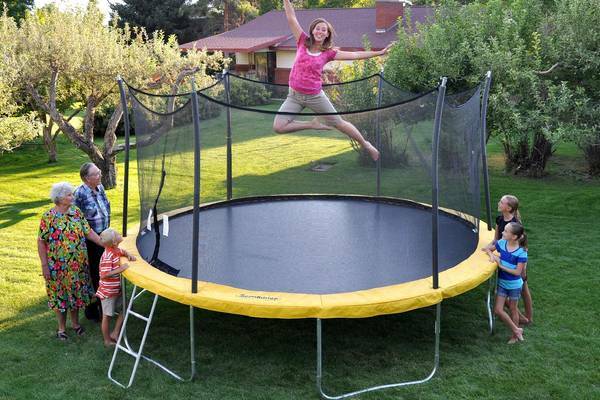 First, you want to measure the available space in your yard to see what size trampoline is most accommodating. For instance, if you’ve only got a 24-foot backyard, you may want a 12-foot trampoline as opposed to a 15-foot trampoline. You may not want all of your free space, or for that matter, even most of your free space taken up by a trampoline. The reason we bring age up is that trampolines over 1 ½ feet in height are not recommended for children under six years of age. Falling from a trampoline can result in a fall from a height of 3 to 4 feet, and the rate of injuries from falls from trampolines is enormous. Always keep this in mind, if you must buy a larger trampoline for one of your older children and a younger child wants to jump, just get an enclosure, so that you can be sure they won’t fall off and injure themselves. The weight of your children only comes into play because they could have friends over, and some people are just heavier by nature. With all of the variables considered, you can expect the smaller trampolines to handle less weight than larger ones. For instance, a 12-foot trampoline might give you a 250- pound limit, while at 15-foot trampoline may go up to 400 pounds. In addition, the type of trampoline pad and the type of springs that are on the trampoline will have a lot to do with the weight capacity as well. If you need a higher weight capacity, look at the specs on the trampoline before you buy it. Make sure you buy top quality, and always look for the best warranty. When considering a 12 or 15-foot trampoline, safety would only come into play when you have more than one person jumping on it, in which case you would want the larger one. In addition, you always want to consider having one spotter present to watch the kids while they jump, unless you feel like spending the money on an enclosure. In 1999, there were over 100,000 injuries from home trampolines, and that’s just the document it ones. Also, it’s safer to only have one jumper at a time, because it avoids collision injuries, and bounces in unexpected directions. So, Is a 12ft Trampoline Big Enough? Once you have the measurements of your backyard or available space, the trampoline you pick is going to be entirely up to you. As previously stated, the 12-foot trampolines are going to have a lower weight capacity than the 15-foot trampolines. Also, if you’re concerned about the weight capacity, you might want to consider going with a rectangular t﻿rampoline as it has a higher capacity. If you have a child that is practicing gymnastics, you want to go with the 15-foot trampoline, because it will provide a higher bounce and more surface space. One more thing to consider when deciding on a 12 ft or 15 ft trampoline, is how fast your children are growing, and how many friends they have. Once you take all these things into consideration, it will be easier to select the appropriate trampoline to fit your needs. We hope this helps, and stay safe!